If you’ve got an Xbox 360 in your gaming den and like to play online, you know just how exceptionally awesome Xbox Live is. Well, one of Windows Phone 7’s greatest features is the tight Xbox Live integration. Your XBL avatar, your achievements/gamer score and your friends; they can all be carried in your pocket with a WP7 smartphone. Nearly all games on Windows Phone 7 are priced twice or even four times as much as the same game on the iPhone! Consider the following glaring examples: Max & The Magic Marker, Deer Hunter 3D costs just $0.99 on iOS, whereas it costs $4.99 on WP7. 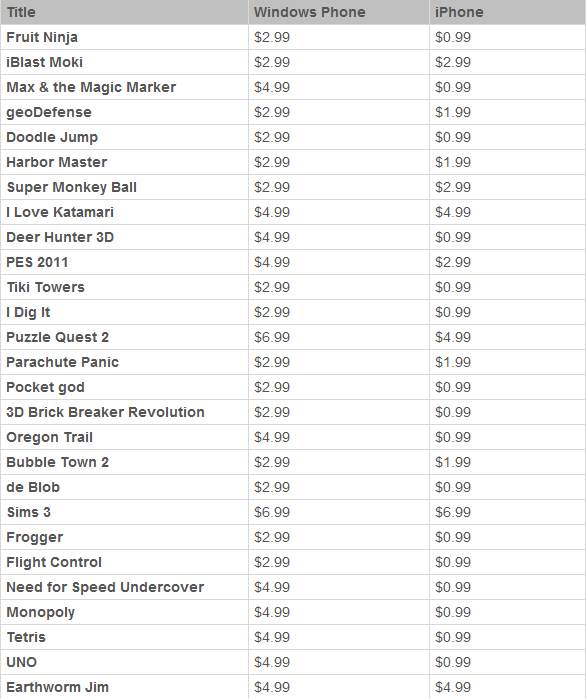 Then you’ve got games on WP7 that are priced twice as high as their price on iPhone: Bubble Town, geoDefense. It’s quite rare to find titles that are priced same on both platforms (The Sims 3 being one example; being priced $6.99 on WP7 and iOS). There are two potential reasons for this. Firstly, to integrate their game with Xbox Live, developers have to put in more work, which they believe they should charge the user for. Secondly, Windows Phone 7 doesn’t have as large a user-base as the iPhone; so in order to maximize revenue, they their price games at a higher price. However, the second reason might be counter-productive, since, the higher pricing might actually make casual gamers consider getting their gaming fix from iOS (where games are cheaper) or Android (where games are generally free+ad supported).